Come Autumn and the clear blue sky, the little clouds floating across it, the mild fragrance of Shiuli and the gentle breeze that blows from time to time has a special significance for the Bengalis. It brings to mind the thought of Durga Puja. The most important annual festival of Bengali Hindus, Durga Puja is believed to be the occassion that celebrates the homecoming of Goddess Durga with her children for a few days. The actual celebrations of the festival are held for four days that are set in accordance with the traditional Hindu Calendars and change every year. 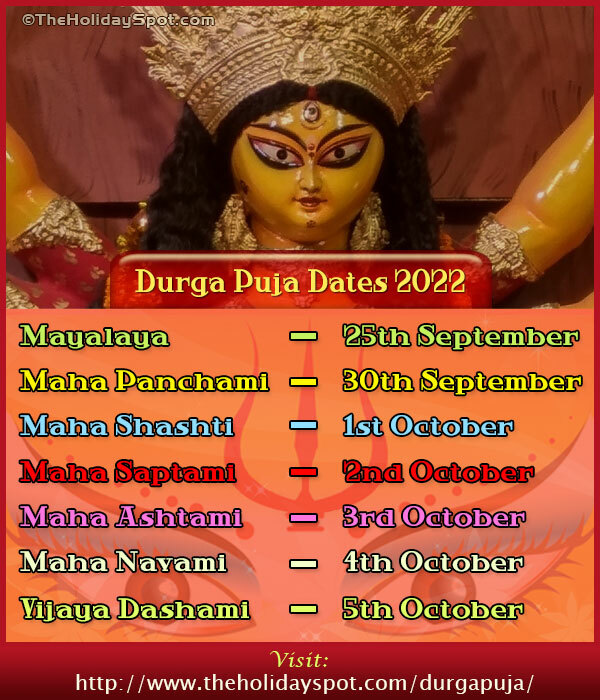 Here we bring to you the Durga Puja schedule for this year that includes the dates as well as the timings for all the four days of this year's Puja festivities, in EST, GMT, and IST. So scroll down, have a look at the dates of the Puja Days for this year and check it out with your local timings. Shubho Sharodiya! Durga Puja is the sacred five day festival of the Bengali Hindu community held in honour of Goddess Durga and to celebrate her annual homecoming. This year, the occassion is to be observed from 14th October (Panchami) to 19th October (Dashami). Scroll down and have a look at the Puja schedule for the year 2018 based on the IST (Indian Standard Time). Sasthi is believed to be the day on which the Mother Goddess arrives on the earth with her children. Goddess Durga's arrival on Boat and Goddess Durga's departure on Horse. Shubh Durgotsav! Puja - Bengal Maha Navami, Durga Balidan, Navami Homa. Durga Visarjan, Vijayadashami, Sindoor Utsav.